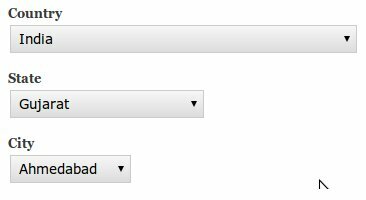 This Codlet allows you to load state and city dropdown fields from country you select. 1. select country, states dropdown will be loaded from country. 2. select state, city dropdown will be loaded from state you select. First you need to create a custom module and use the fields name that you have created in your respective content type. You will also need to change the function name according to your module name. Make sure your system has all the required PHP extensions enabled. I am attempting to turn the city field in the locations module into a dropdown dependant on the country. I feel like this might be a start. The problem is its a multiple value field so I am confused on how I can modify this code to suit my needs. Do you have any ideas? Given example is for 3 Dropdown (Countries, States and Cities), In your case , you need to remove a States Dropdown code from given example, for a multiple value field I think its as it is. I am using this custom module to apply dependant dropdown inside the field collection. Just a quick question how do you populate the country options in the select list ? Since in my country select list option I populate the data in CCK field. It makes an ajax call but nothing is shown up ? Could it be possible to have the full downloadable version of this code ? add bellowed code for pre populate field on your hook_form_alter function. Then only I can see my country select list populated with data. But it always complain the switch case condition for undefined variable $country_options , $state_options and $city_options. If you already make this custom module work inside field collection can we have a look at your codes ? Please have a look at this of hook_form_alter, and ajax call back function. Hello tester_np, is this working for you? let me know if I can do anything for you. I have a small concern, is the definition for the function _get_location() is the same as the first code that you have posted, since I don't see its definition there in the code you have posted above. Another is I use the data for the Country, State and City while I was creating the select list option for the cck field inside the field collection. I am not sure whether this work in a field collection with unlimited option. To make it working with field collectin, you may require some more code, related to field collection. But at most, current code should work out of the box! This is the all the code I am not sure what you are missing. Hello! i'm working on a similar code so far the first two levels are working but the 3rd one it's not updating after user select (state) sencond dropdown... could some body help my find the problem this is the link to the question at drupal.stackexchange:https://drupal.stackexchange.com/q/194141/56202 if your not registered at stackexchange you could answer me at this site... thank you for your help!!!! Hello @GoldenHawk, You did well and its working, Here is the code which one working fine for me. If still not working reply me. Thank you!! turns out the error wasnt at the code... it was an error at some database values. I tested your code and its working good too.. THANKS! We are glad that worked. We would appreciate if you can share your live codes too. Do we have to add names manually? Do we have to add countries, states and cities manually? Either you can read the country/sate & city details from a file with short codes or from DB. It completely depends on the way you want it. This CodeLet just suggests a way to achieve the desired result.